The main difference between liposomes and niosomes is that liposomes are made up of phospholipids, which contain two hydrophobic tails whereas niosomes are made up of non-ionic surfactants, which usually contain a single hydrophobic tail. Furthermore, liposomes may or may not contain cholesterol while niosomes contain cholesterol. Moreover, liposomes are prone to oxidative degradation, but niosomes are more stable. Therefore, niosomes are an easier and inexpensive way of carrier systems. Liposomes and niosomes are two types of assembled vesicles which can carry hydrophilic molecules inside the core and hydrophobic molecules in between the bilayer. Liposomes are bilayered vesicles consisting of an aqueous core enclosed by a membranous lipid bilayer composed of natural phospholipids. Here, the most common naturally-occurring phospholipid is phosphatidylcholine. The size of the liposomes can range from 20 nm to several micrometres. British haematologist Alec D Bangham described them first in 1961. Moreover, the phospholipids of liposomes are amphipathic molecules, containing a hydrophilic head group and two hydrophobic tails. Therefore, in an aqueous medium, phospholipids align closely to form a planar bilayer sheet, minimizing the unfavorable effect of the aqueous phase and the folding of this sheet, forming a vesicle can completely eliminate that unfavorable effect. However, some liposomes consist of a single phospholipid layer. Furthermore, liposomes work as carriers for the administration of drugs and nutrients. Here, the drugs or nutrients are dissolved in the aqueous core of the liposome. 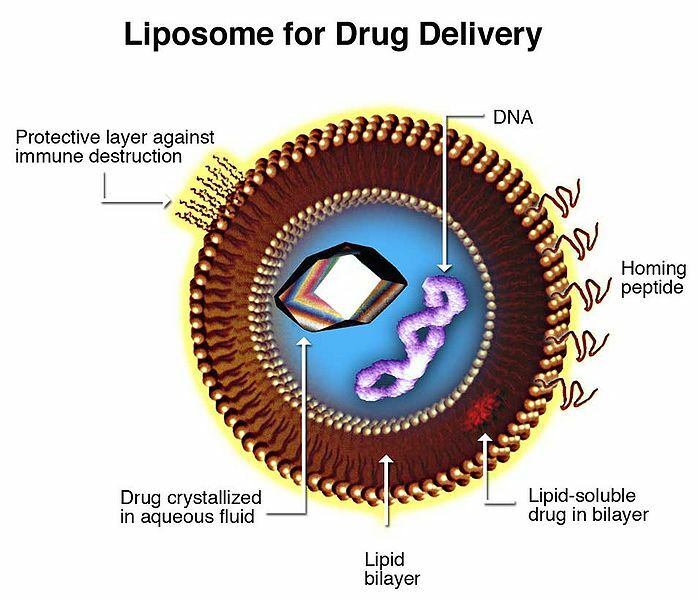 Liposomes are capable of providing a selective, passive targeting to the drugs in a process known as liposomal doxorubicin. Thereby, they increase the efficacy of the therapy. Also, this reduces the toxicity of the drug due to the encapsulation. However, liposomes are less stable, and they have a short half-life. Also, they are less soluble and sometimes undergo the leakage of the encapsulated drug. Niosomes are synthetic vesicles consisting of an aqueous core enclosed by a non-ionic surfactant-based outer layer. Here, the layer can be either unilamellar or multilamellar, which means containing a single or several bilayers respectively. The size of niosomes lies at a microscopic level. Niosomes are very similar delivery systems to liposomes, which can carry hydrophilic molecules in the aqueous core and hydrophobic molecules in between the bilayer. In comparison to liposomes, niosomes are more stable and osmotically active. Also, apart from the non-ionic surfactant, the outer layer of niosomes contain cholesterol, which provides rigidity and proper shape. We can see the applications of nosomes in Leishmaniasis, immunological adjuvants, oncology, transdermal and oral drug delivery, and diagnostic imaging. Liposomes and niosomes are two membranous vesicles used to carry molecules to the target. Both consist of a bilayer made up of hydrophobic molecules and a hydrophilic core. Also, both serve as a vehicle for the administration of pharmaceutical drugs and nutrients, which can be either hydrophilic or hydrophobic. Both types of delivery systems reduce the toxicity of the drug and the therapeutic index of the drug. Besides, they both are biodegradable, biocompatible, and non-immunogenic. Liposomes refer to a minute spherical sac of phospholipid molecules enclosing a water droplet, especially as formed artificially to carry drugs or other substances into the tissues. Whereas, niosomes refer to the synthetic microscopic vesicles consisting of an aqueous core enclosed in a bilayer consisting of cholesterol and one or more nonionic surfactants. Thus, this is the fundamental difference between liposomes and niosomes. Furthermore, liposomes are a naturally occurring type of vesicles, while niosomes are a type of synthetic vesicles. Another difference between liposomes and niosomes is their size. Liposomes are comparatively large (10-3000 nm) vesicles while niosomes are smaller (10-100 nm). An important difference between liposomes and niosomes is that liposomes consist of a phospholipid bilayer while niosomes consist of non-ionic surfactant of the alkyl or dialkyl polyglycerol ether class. The primary type of phospholipid found in liposomes is phosphatidylcholine while Span 20, 40, 60, 80, 85 and Tween 20, 40, 60, 80 can be found in niosomes. Hence, this is another difference between liposomes and niosomes. Moreover, the phospholipid molecules of liposomes contain two tails while the non-ionic surfactants of niosomes contain a single tail. Also, the hydrophobic bilayer does not contain cholesterol while the hydrophobic bilayer of niosomes contain cholesterol. Another difference between liposomes and niosomes is that the liposomes are less stable since they are prone to oxidative degradation, but niosomes are more stable. Besides, while liposomes have a high production cost, niosomes are inexpensive to produce. Additionally, special storage conditions are required by liposomes while niosomes do not require such conditions to store. Toxicity is also a difference between liposomes and niosomes. Liposomes are comparatively toxic while niosomes are less toxic. 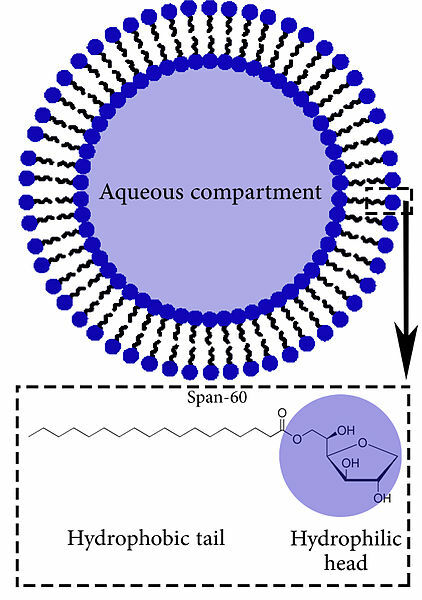 Liposomes are used as carriers in both gene delivery and drug delivery, in multidrug-resistant enzyme replacement therapy, chelation therapy while treating heavy metal poisoning, antiviral and antimicrobial therapy, tumor therapy, immunology, and cosmetology. In contrast, niosomes are used in Leishmaniasis, immunological adjuvants, oncology, transdermal and oral drug delivery, and diagnostic imaging. So, this is also a major difference between liposomes and niosomes. Liposomes are a type of naturally-occurring vesicles, consisting of an aqueous core surrounded by a phospholipid bilayer. In comparison, niosomes are synthetic vesicles, consisting of an aqueous core surrounded by non-ionic surfactants. Liposomes are less stable while niosomes are more stable. Both liposomes and niosomes are important as vehicles to transport drugs and nutrients to the target. The main difference between liposomes and niosomes is their composition of the hydrophobic bilayer and stability.